The Norbeck Byway turns southeast on SD-87 and starts climbing into the heavily wooded mountains until reaching very beautiful Sylvan Lake. The idyllic lake offers all kinds of recreational opporunities such as picnicking, hiking, and fishing. 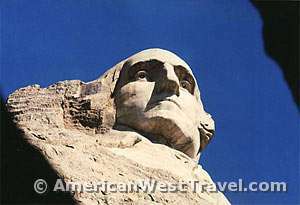 East of the lake, the route becomes the Needles Highway which features bizarre rock formations such as the Needles Eye and Cathedral Spires. Soon the road starts descending, entering denser wood and passing by the Black Hills Playhouse. This unique theater has been entertaining visitors for sixty years, and is a pleasant place to visit on a summer evening. 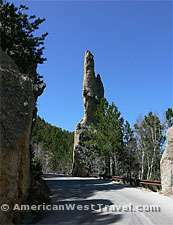 The route shortly returns to US-16a in Custer State Park.